When you hear some of the compliments tag managers get, you’d expect them to blush – if they could. “The democratizer of digital marketing”, “the most important tool in a marketer’s arsenal”, with it “web analytics become simpler and more efficient”, and the list goes on. You might think a tag manager solution is the best thing that ever happened to digital marketers. But let’s be honest, no amount of praise is convincing if it’s not backed up by a myriad of examples and evidence. The days of believing beautiful marketing language are long gone, and they’re not coming back. If Piwik PRO Tag Manager really allows you to operate quickly, efficiently and cost-effectively then you need proof. And we fully understand that. 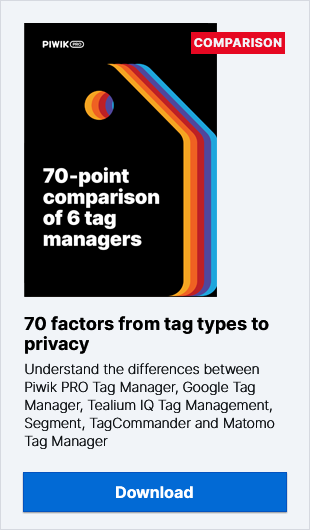 That’s why over some time we created a number of blog posts to familiarize you with the usefulness of Piwik PRO Tag Manager. We didn’t want to just bore you with data, and provided a whole list of use cases and examples you can duplicate on your own. Because is there a better way to learn something than by actually trying it out yourself? Yeah, I knew we’d be in agreement here. And as our list of blog posts grew and grew we decided to gather them all up in one place, so you could use this post as a practical guide. A quick course in Piwik PRO Tag Manager’s usefulness if you will. Learn how to implement pk_ parameters and pk_ tags, which are responsible for tracking campaign data and are an essential part of Piwik PRO reports. Thanks to them you’ll be able to determine the source of your traffic very accurately (if, of course, you create a well-organized tagging scheme). Find out how to configure goals to reach the heart of web analytics: conversion tracking. Track goals todraw conclusions, and learn how to do it using Piwik PRO Tag Manager. What to do, when the main website has subdomains that you want to track along with the main site as one instance so that you can collect the combined data for all the visitors on all the subdomains? That’s what Piwik PRO Tag Manager subdomain tracking is for. Learn how to avoid issues with measuring time when a visitor only visits one page, since Piwik and Google Analytics tracks the entire session as 0 seconds. Configure Piwik PRO so that it more accurately measures the time spent on the last page of a single visit with the help of Tag Manager. Find out how to track which referrer was first in a conversion process using Piwik PRO Tag Manager. Let’s see how you can do this quickly and know which source and medium was responsible for acquiring visitors who converted. Track dynamic reloads after form completion, links to other domain websites such as clicks directing your visitors to your Facebook or YouTube pages. Do it by creating a physically nonexistent URL which is used only for reporting. Track the percentage of content that was displayed during the pageview with content tracking feature. Check to see if your content is being read by your visitors using Piwik PRO Tag Manager. Set custom page titles which will be only visible in Piwik PRO reports. Don’t let your reports become unclear when you optimize page titles for SEO and set a clear and meaningful custom page title using Piwik PRO Tag Manager. Test different elements of your web content by comparing two versions of your website. Launch A/B tests quickly and effortlessly by combining Piwik PRO Tag Manager with Optimizely. Now that’s a lot of information to digest! And you know what? We’ve got even more! Just in case if you still don’t get enough, find out how your web analytics can team up with a Tag Manager for better insights. This will be a little “dessert” of use cases. Now I’m sure you have enough materials on your hands, and Tag Manager will never again be a mystery to you. If you have any questions regarding Tag Manager, contact us. Maybe there are more use cases you’d like us to explore? Because you can be sure, we aren’t done with the usefulness of Piwik PRO Tag Manager just yet!